I actually get asked this question quite a bit – What foods do I keep in our pantry? And I kinda understand why. My pantry is relatively small and I don’t stockpile as much as many people expect. Especially for a family that depends on their pantry stock for a lot of our meal ingredients. The Reason we can operate with a smaller pantry since making the change to Clean Eating, is simply this: We don’t buy a lot of pre-made goods. 80% of the things I stock are just ingredients that I use to make up other food. And you tend to use the same basic real food ingredients to make up a wide variety of recipes. 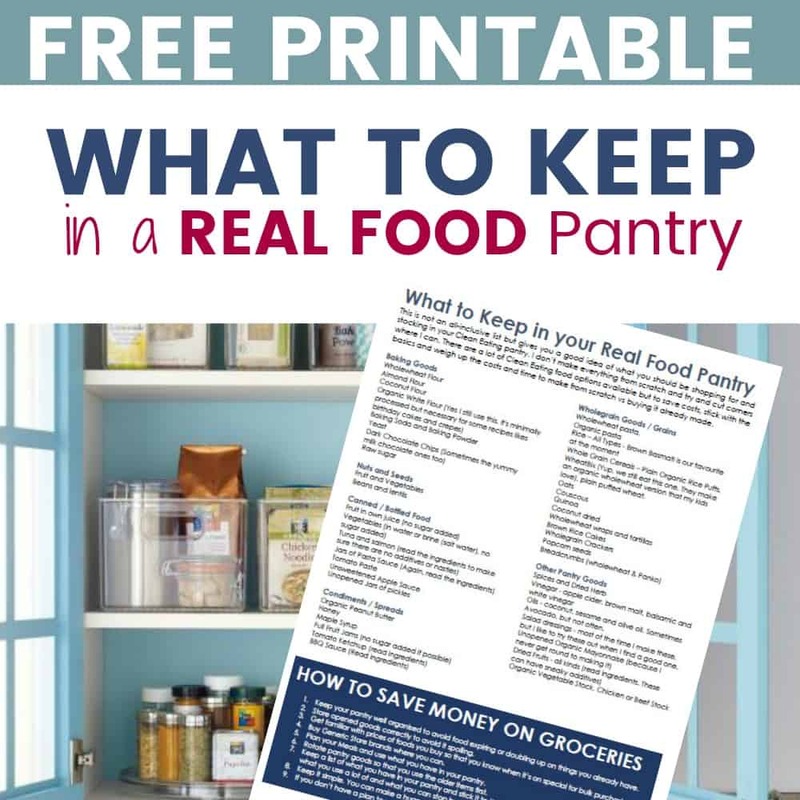 FREE PRINTABLE: Get your Real Food Check List and Pantry Inventory Printable here. Know what’s in your Pantry with this one page spreadsheet. 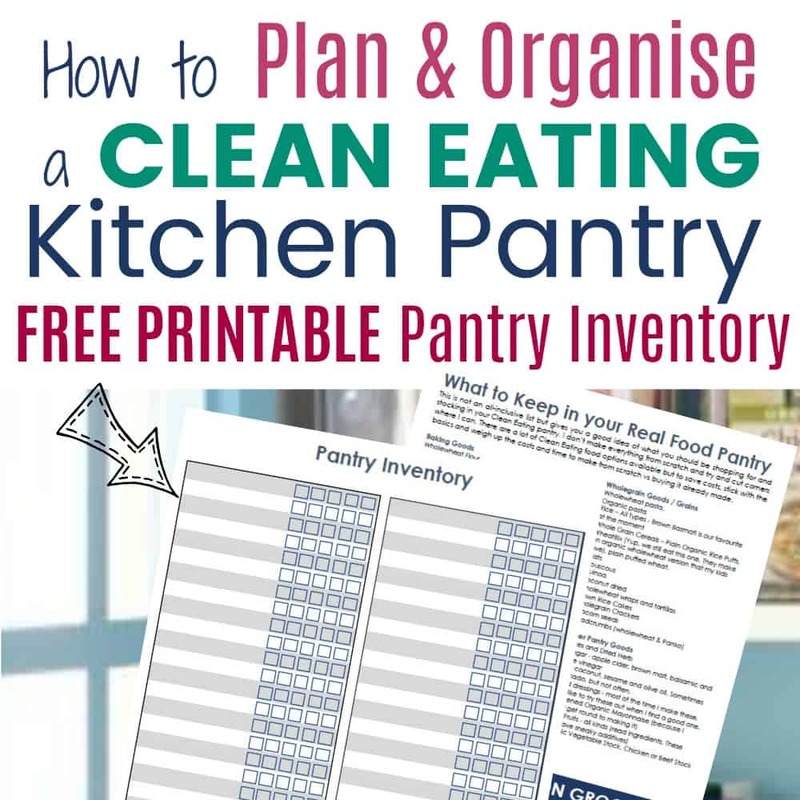 Download our Handy Pantry Printable. Stick it to the back of the pantry door for a quick reference of all the goods inside. No more wasted purchases or missing recipe ingredients. If you think of a Supermarket. 90% of the shelf space is taken up by processed, packaged goods made by big brands pretty much selling the same thing. Real food ingredients only take up the remaining 10% of shelf space. They have an entire aisle dedicated to breakfast food and another just for confectionery and soda. Once you stop stocking these goods, you will find you have a lot more space in your pantry. This is not an all inclusive list, but gives you a good idea of what you should be shopping for and stocking in your pantry. You can print out and keep a copy of the list here. Oils – coconut, sesame and olive oil. Sometimes Avocado, but not often. Salad dressings – most of the time I make these, but I like to try these out when I find a good one. Whew. That pretty much sums it up. You can Download the full pantry list here. Hope that helps you get an idea of what you should be shopping for. The fun thing about real food is that you can make so many different recipes using just a few basic ingredients.